Jonathan Ross was visiting the award winning Halloween scream park with his wife Jane Goldman, his daughters, son and friends. Voted the UK’s best Halloween attraction for three consecutive years, a trip to Tulleys has become an annual delight for scare fans, the Ross family. 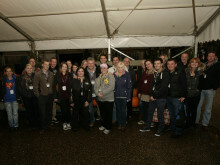 “Halloween wouldn’t be Halloween without a trip to Tulleys Shocktober Fest. It’s almost too much fun! I love it.” Said Jonathan. 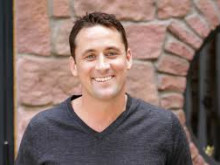 “The kids enjoy Halloween and so do we. Every year we throw our own Halloween party and create our own spooky maze in our back garden but it’s not a touch on Tulleys”. Jonathan and his family ventured boldly around the Tulleys Shocktober Fest Scream Park, holding on to each other for support. Enjoying an early dose of Halloween fun with someone else to do the scaring, the family rode the popular Haunted Hayride through the farm’s mysterious woodland, immersed themselves in The Cellar, a terrifying haunted house full of undead and trod carefully through the new outdoor maize maze WoodShock, based on the zombie aftermath of the infamous rock festival. Stocking up with a few Halloween costumes, props and trinkets before leaving for home, the smiles were wide for the Ross family. Other famous faces who have been spotted at the Tulleys Farm Halloween event include EastEnders star Shane Richie, reality TV star and pop sensation Peter Andre, dance group Diversity, rock legend Sir Bob Geldof and British Superbike Champion Tommy Hill. Tulleys Farm Shocktober Fest Scream Park is open until Saturday November 2 and tickets can still be purchased online at www.tulleyshalloween.co.uk. 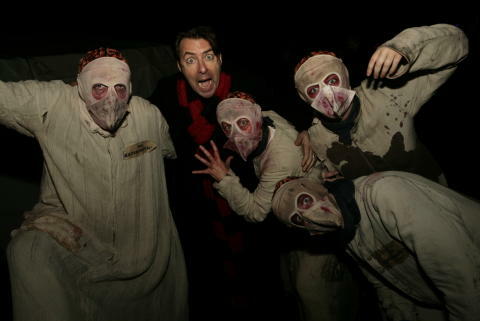 Jonathan Ross take fright at some of the Tulleys Farm Halloween creatures. Photo courtesy of Stephen Candy. Shocktober Fest Scream Park at Tulleys Farm is an interactive and immersive Haunted Adventure with six main Haunts; the infamous Haunted Hayride, The Creepy Cottage, Hell-ements, Twisted Maze, The Cellar, and new for 2013, 'Woodshock ... Rottin since 69!' in the haunted cornfield. It has been named Halloween event of the year in the Halloween industry Screamie awards for the past three years running. The Scream Park also incorporates three Food Courts, Street Theatre, and NEW for 2013 - the WoodShock live stage, Cirque de Shock, the Haunted Fun Fair (additional ride charges apply) and the After Shock (Red Cross) Bar. This year Shocktober Fest runs for 17 nights between 10 October and 2 November. open at 6.00pm (5.00pm on peak nights). The park closes at midnight. Fireworks Festival Finale - Saturday 2nd November, the last night of Shocktober Fest, is also a spectacular Fireworks display choreographed to music, 7pm. Online ticket prices range from £9.95 for the off-peak Street Pass which gives access to the street entertainment and live bands on the WoodShock stage to £32.95 for a peak night X-Scream pass for all six rides and attractions. For the best prices and to guarantee admission you are advised to buy tickets online in advance. 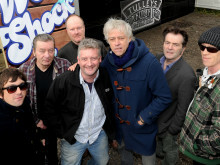 Tickets on the gate are more expensive and may sell out on peak nights www.tulleyshalloween.co.uk. event at Tulleys Farm is open on the weekend of 19 & 20 October then daily from 26 October – 2 November. Open from 10.30am – 4.30pm (live actors on the Horrid Hayride from 2pm). Activities for families and young children including; Horrid Hayride, creepy cottage, boo barn, pumpkin shy, giant slides and fancy dress parades. Admission for a family of 4 ranges from £42.95 to £54.95. Advance booking online is advised for discounted tickets and to guarantee admission. Tulleys Farm, Turners Hill, Crawley, West Sussex RH10 4PE, Tel 01342 718472, www.tulleyshalloween.co.uk. On Friday the 11th of September Tulleys Farm, home to the UK's No.1 Halloween attraction 'Shocktober Fest', hosted 'Behind the Screams' conference to all those who own, or have dreamt of owning & running a Halloween scare attraction.